This is a very easy salad made with fresh vegetables, couscous and a simple lemon dressing. It is quick to prepare and makes a filling meal. It's perfect for lunch or a light dinner or even as a side dish. Today we will learn how to make couscous salad following this easy recipe. Place couscous in a bowl. Boil water with a little salt or vegetable broth (non vegetarians can use low sodium chicken broth) and pour it over the couscous. Cover and let is sit for 10 minutes. The steam will cook the couscous. After 10 minutes, fluff it with a fork and leave it to cool. Mix the couscous with the vegetables. In a small bowl, whisk together olive oil, lemon juice, salt, pepper powder and add to the couscous. Mix until well combined. Adjust lemon juice, salt and pepper powder to your taste. 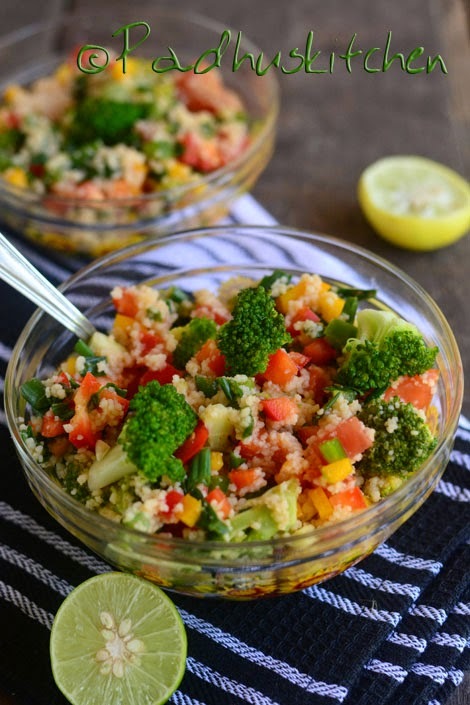 Enjoy making this healthy and colorful Couscous Salad in less than 15 minutes! What is couscous tamil name. .?